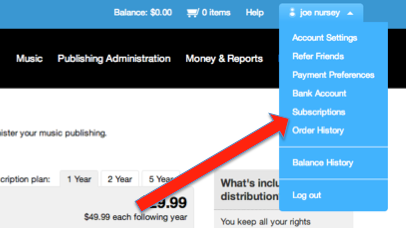 Click "Subscriptions" in the drop down under your name. You can pay for the renewal by clicking the "Pay Now" button next to the release that is due. After you pay, that payment method will automatically be saved in your "Payment Preferences." If you do not want this and prefer to pay manually, you can contact us from your account's registered email address and ask to disable the auto-renewal feature on your account. This means that you will have to pay for any upcoming renewal on your own. If you decide you want to turn the auto-renewal option back on, you can do so at any time by logging in to your account, rolling over the "Money" tab, and editing your payment preferences.